As a long-time fan, I was really excited to learn that this K-beauty fave is now available online through BeautyMNL! The store offers next day delivery, cash on delivery options, has an app for even easier navigation, and often has flash sales. BeautyMNL is more than just a store, as it also produces informational beauty stories and helpful tips. And in case you missed it: they deliver orders by the very next day - instant gratification! I have even experienced checking out my cart in the wee hours of the morning, and waking up to my find that my order had been delivered! At the TFS x BeautyMNL launch, they announced that any order that includes any item from The Face Shop will get free nationwide shipping, regardless of total cart amount. The promo ends by April 30th though, so better start checking out your shopping carts! Don’t know what to get? I gotchu, fam. We got a sneak preview of a new product that got me excited! The Multi Swing Cushion looks like a typical cushion, but it actually has a tray below that swings out to reveal a concealer balm and blush! It’s the perfect addition to any kikay kit, for beginners and makeup collectors alike. It’s not available locally yet, though, so better keep your eyes peeled. The Jeju 99% Aloe Fresh Soothing Gel finished second place in my Aloe Vera Gel battle article, for good reason. If you’re into cushions, you need try the CC Long-Lasting (it’s infused with primer!) or the CC Intense Cover (awesome coverage and decent staying power). The Dr. Belmeur line was developed for sensitive skin, and is a great starting point for those just starting to build their skin care lineup. They have a good variety of sunscreens, too! As for makeup, I regularly use their Ink Lasting Foundation with SPF 30 PA++. It actually has decent coverage but manages to look like healthy skin. TFS brow pencils are da bomb! My personal fave is the Designing Eyebrow Pencil. Most TFS products I own are for skin care. so I decided to shop for makeup with the GCs they gave at the launch event. What kind of look could I do with P2,000? Apparently, I had enough to do a full face! Here's what I got: Photo Blur BB Cream (P395), Concealer Liquid Veil in N203 (P395), Finger Cotton Tint in 08 Brown-presso (P495), Oil Clear Smooth & Bright Pact in N203 (P395), Mono Cube Eyeshadow in BR04 Chai Tea Chocolate (P350), Lovely Me:Ex Style My Eyebrow in 02 Black Brown (P150), and Freshian Volumizing Mascara (P195). Okay, okay, so my total came to P2,375 but I had to, since I couldn’t go under budget (sayang ang GC!). Just please consider the powder optional, for those with oily skin. The Photo Blur BB Cream is included in our list of good budget BB creams, and how awesome is the fact that the price hasn’t changed since 2016! I was hesitant at first, since it came in only one shade that was obviously too light for my skin tone, but I managed to make it work by concentrating its application on the center of my face. It surprisingly does even out my skin! It doesn’t offer much in the way of coverage, but I like that it made my skin look healthy. I’ve tried the Liquid Veil Concealer before, so I already know that it’s not the most pigmented concealer out there. It was able to conceal some of my hyperpigmentation though, and felt very comfortable on my skin. My hands-down fave of the bunch would have to be the Finger Cotton Tint in 08 Brown-presso. It’s their latest lip product, featuring a cushion applicator with a pointed tip. I usually like blending my lippies either with my finger or a tissue to blend and remove the excess, but the design for this tint lets me skip that step! I like the velvety matte finish on my lips. It also served as my cheek color for my P2,000 FOTD. Unlike most water or gel tints, this one was a dream to blend on the cheeks. I took my sweet time blending without it anchoring onto my face. The shade Brown-presso is a lovely brick red, a refreshing change from the typical red and pink Korean tint shades. After that, I set my face with a powder brush and the Oil Clear Smooth & Bright Pact in N203. 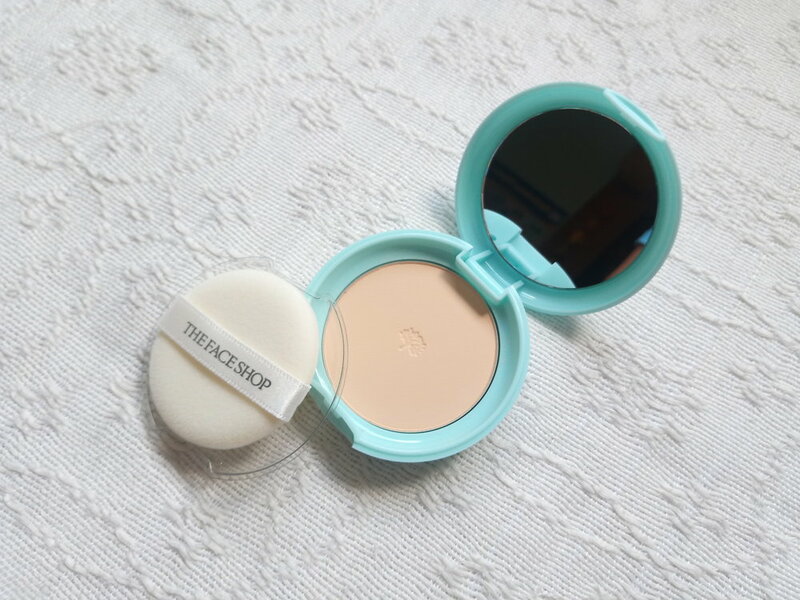 This is a great option for on-the-go retouches; it absorbs oil but doesn’t make the skin look dry, has a good-sized mirror, and most importantly, is formulated to contain SPF 30 PA++. Filling in my arches with Lovely Me:Ex Style My Eyebrow in 02 Black Brown was really easy! I had to reach for a spoolie to blend out the edges, but I like that I can draw hair-like lines with its fine tip. And how cute is the Mono Cube Eyeshadow in BR04 Chai Tea Chocolate? You can totally create a custom palette with its toy-brick-design. It’s surprisingly pigmented, and comes in different shades and finishes. I used my ring finger to apply the color, and an eyeshadow brush to blend the edges. I was told that the Freshian Volumizing Mascara came in two variants, but the Curling one was out of stock. I really like that the Volume variant didn’t clump on my lashes, but it didn’t exactly enhance the curl. This is the look I came up with! It’s not perfect, but I was able to do my usual everyday look, so I consider it a relative success. I tried this on a hot day and my sweat made some makeup near my hairline disappear before I took photos, but the rest held up. I oiled up around two hours after application, but everything miraculously stayed put after blotting. Predictably, the eyeshadow creased. I feel like a decent eyeshadow primer would resolve this though, and make the colors more vivid as well. The mascara didn’t smudge! The volume and length stayed, but the curl made an early exit. That eyebrow pencil is such a steal at P150! It’s the perfect color for me and it stayed on the whole day. My base finally fell apart at around the 6-hour mark, which I feel is still pretty decent given that I hadn’t used primer or setting spray. Overall, I think I was able to pull off a half-decent full-face look for just a little over P2,000. 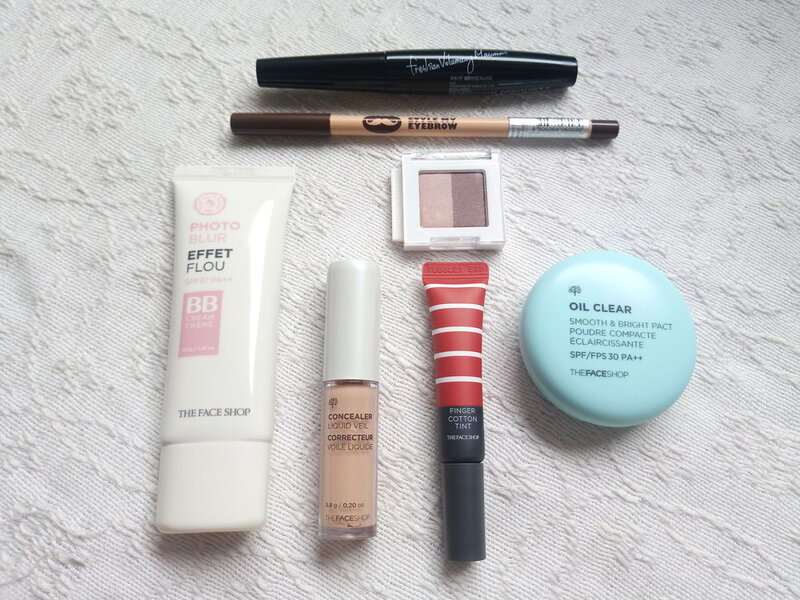 If you're looking for budget makeup options, The Face Shop products are definitely worth trying! I'm already looking forward to seeing TFS promos on BeautyMNL since it gives me the chance to hoard my faves. I hope they carry the newest product additions soon, as well! What TFS products would you order from BeautyMNL? Got any HGs from the brand? Share them in the comments below!